I’m on MMO hiatus, recovering from burnout, but LoTRO is the one game that tempts me. It’s mostly for the crafting, and farming particularly. All Hobbits, and me, share a love of things that grow. Wow. How long does it take for those to grow? The crops grow at the ultra-realistic speed of instantly. I’d buy on for a $. I haven’t even started growing pipeweed, let alone getting into the cross-breeding involved. I really enjoy the farming, I just wish it was more involved. I’d love to clear stones from the field, pick weeds, have the crops take a little longer to grow, etc. Just what we need, a more robust farming simulation. I don’t know whether to applaud or cry at this suggestion. I should have used “a little” in there. I’m not looking for a farm sim, just a little more than the current instant crop system. I enjoy it as is, maybe I should just be happy. IIRC, there is a special crop you can plant during the summer festival which you won’t be able to harvest until the autumn festival. @Thosel: That’s right. You can plant black mushrooms in summer, then get a Black Mushroom Pot (to decorate your house with) in autumn. 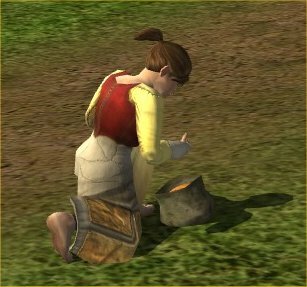 Farming in LotRO is a lot of fun. Cross-breeding can be a little slow at first, but it does make the experience more interesting. The only downside to the who process is that it is rather costly. You people are nuts. Awesomely, charmingly nuts. But clearly nuts.